This book is concerned with how we can make sense of the confusing landscape of individualistic explanation in international law. 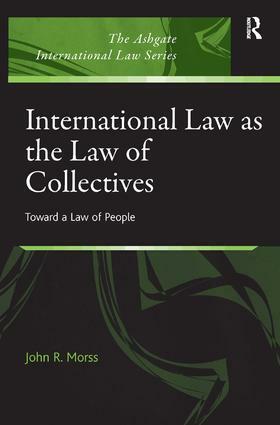 Arguing that international law lacks the vocabulary to deal with the collective dimension and therefore perpetuates an individualistic vocabulary, the book develops and articulates a more appropriate collective approach for public international law. In doing so, it reframes longstanding problems such as the conflict between self-determination and the integrity of states and the effects and the limits of state sovereignty in an increasingly globalized world. Presenting fresh perspectives on a range of contemporary issues in international law, the book draws on the work of major contributors to legal and political theory. Dr John R. Morss is Senior Lecturer, School of Law, and member of the Centre for Citizenship and Globalization, at Deakin University, Australia. The Ashgate International Law Series brings together top-quality titles, principally in the area of public international law but also in private international law, under the label of a single international series. Each title represents work which is the result of high-level research, aimed at both the professorial and postgraduate academic market, as well as the expert practitioner.